7 Valuable Tips We Took from Noel Clarke's WDYTYA? The former Doctor Who star always believed his roots lay firmly in Trinidad and Tobago where both his parents are from. What transpired was a whole lot different, taking him on an emotional journey of discovery to several Caribbean nations. His sun-drenched adventure has also brought to light some fundamental family history advice that we can all use. This really is the must-have tip for any family history novice. Noel started his journey by speaking to his mother and looking at old photographs which gave him the foundations to take his research further. Older members of your family have memories that you don't have and, in a lot of cases, won't have heard before, so make the most of them while you can. Here are 20 questions you should be asking. Noel was astonished by what he discovered on his great grandparent's marriage certificate. With it, he first realised he wasn't 'Trini' to the core, as the record showed the couple were actually married in Saint Vincent and the Grenadines. Not only that, it also included their ages, occupations and the date of their marriage - all new information to Noel. Never underestimate what marriage records can add to your research. They are essential for every family tree. Sometimes, and for whatever reason, the records you need just don't exist. Noel found this out when he tried to trace his great grandparents' births in Saint Vincent and the Grenadines. In his case, those records were destroyed in a volcanic eruption! To overcome this obstacle, try alternative sources of information or focus on another branch of your family tree that could unlock a clue. When Noel's great grandfather died, his great grandmother had to go to America to get work and support her family back in the Caribbean. In fact, she spent several years in the US and even applied to become a citizen, as we found out from her naturalisation record. As you can see from the image above, these records hold extensive information on our ancestors. 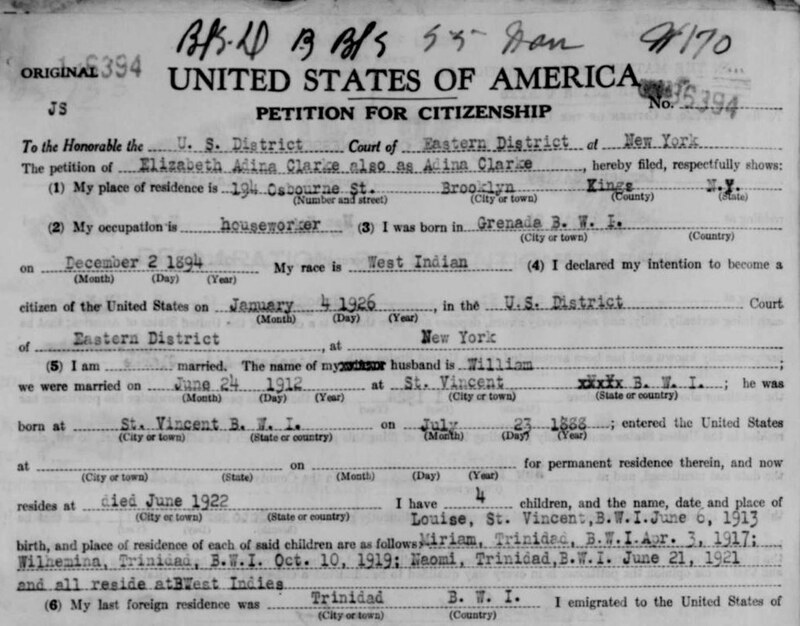 Noel's great grandmother's record revealed her full address in America, her occupation, and next of kin information. So, if your ancestors settled in a new country, make sure you search for their naturalisation records to give yourself the chance of finding a gem like this. Following the paternal line of his family tree, Noel focused on his grandmother, Manelvia, who he knew little about. He would go on to find out she was a well-respected member of her community, but not before having to dig deep into local sources. Issues around maiden names and a general lack of women featuring in early records, can make tracking your female ancestors problematic at times. Try to overcome this by focusing on a male relative closely associated with the female you are looking for or searching for alternative sources where they might feature. Manelvia, Noel's grandmother, descended from the Bedeau family of Carriacou, another small Caribbean island. His search brought him there where he had several, seemingly spontaneous encounters with relatives he'd never met. While we can't guarantee you'll meet unknown family members if you visit your ancestor's homestead, it's always worth speaking to the locals to find out if there are any connections you can follow up. Our sister site, Genes Reunited, also features a great community forum for tracing living relatives. We couldn't help but be envious of Noel as he ventured from one beautiful Caribbean location to the next in search of his ancestors. So what lesson do we learn from that? Simple! If your family hail from sunnier climes, and you can afford the trip, then we'd definitely recommend combining your genealogy research with a holiday. TAGS getting started wdytya caribbean female ancestors living relatives noel clarke naturalisation records marriage records who do you think you are?